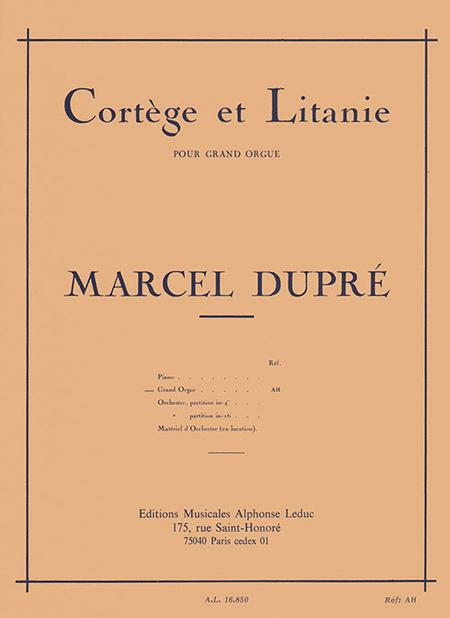 This version of Cortege and Litanie by Marcel Dupré was written for organ. For upper intermediate players, this 8 page composition is written with 4 sharps and includes the use of the pedals. The piece, initially written for a small orchestra in 1922, was created for a play. 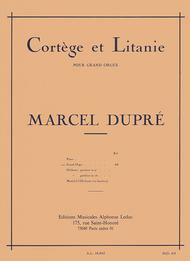 Dupré integrated it into one of his piano recitals and was later asked to arrange it for other instruments. These scores therefore exist also arranged for piano, orchestra (in 4 and 16) and for the conductor. In terms of composition, the piece is divided into two: “Cortege,” which title describes a solemn procession, begins in E major and lasts twice as long as the introductory theme; and “Litanie,” which is describing the prayer sung during a procession and which follows the “Cortege” part to then be joined by it. Marcel Dupré is a French composer and virtuoso organist who won the Prix de Rome in 1914. He became famous when he played the work of Bach in its totality from memory in 1920. He later became the professor of many renowned students at the Paris Conservatoire such as Messiaen, Langlais and Cochereau among others.